Joseph Nicephore Niepce was originally a professional soldier but after falling ill with typhoid he resigned from the army. Niepce was a keen inventor and soon became very interested in the process of lithography. He began experimenting with stone found in the nearby vicinity. The shiny stone was coated with bitumen, engraved and then etched. Niepce soon discovered than when bitumen was exposed to light it would become hard and he couldn’t rinse it off with oil. 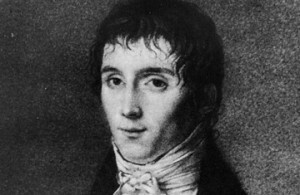 A few years later in 1801 Niepce moved to Nice with his brother Claude. It was in Nice that Niepce kept returning to his original idea of being able to permanently record images using the Camera Obscurra. He published work in 1802 regarding his ideas. Ten years later Niepce began experimenting again but it would take a further 10 years before he was able to capture the first permanent image. In 1822 he was able to produce a copy of an engraving of Pope Pius VII using a sheet of glass sensitized with a coating of asphalt, a substance readily available at the time. The glass sheet was then ‘developed’ by washing it with a mixture of lavender oil and kerosene to remove any unhardened or unexposed places. Unfortunately this plate was lost during Niepce’s lifetime but if it had been preserved it would represent the first photographic print in the world. nature. It was fixed on a pewter plate. 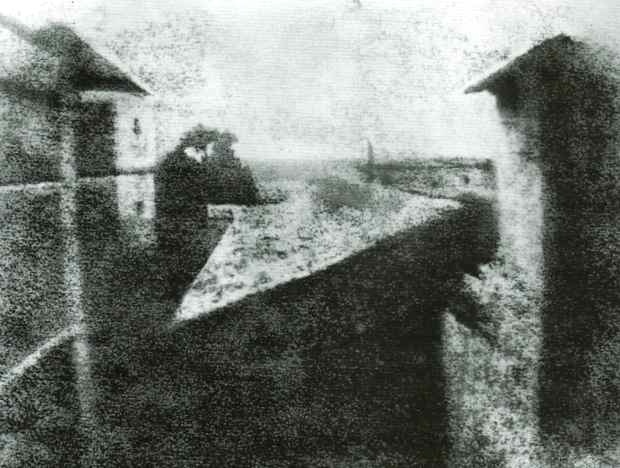 The image was the view from his window at the chateau he lived at. The image took 8 hours to expose and you can see this by shadows falling on both sides of the backyard! The following year Niepce took his image to England where it was lost, only to be discovered again in 1952 by English historian Gernsheim, who kept it for his collection. Heliography was born, a term coined by Niepce for his photographic process as images were produced by sunlight. Over time Niepce began replacing stone with other materials such as glass, copper, zinc and silver. He soon became afraid that all his work and research would be stolen and thus wouldn’t respond to Daguerre’s first attempts to establish a partnership. In 1827 he submitted a report on his findings to the Royal Society but because he omitted the main details, the Society refused to recognize his discovery. In the end he made a deal with Daguerre whose own experiments had processed no results. On his deathbed in 1833, Niepce had no idea how revolutionary his invention was to become and due to his own mistrust of people, he failed to win the fame of being the first person to develop what we know as photography.